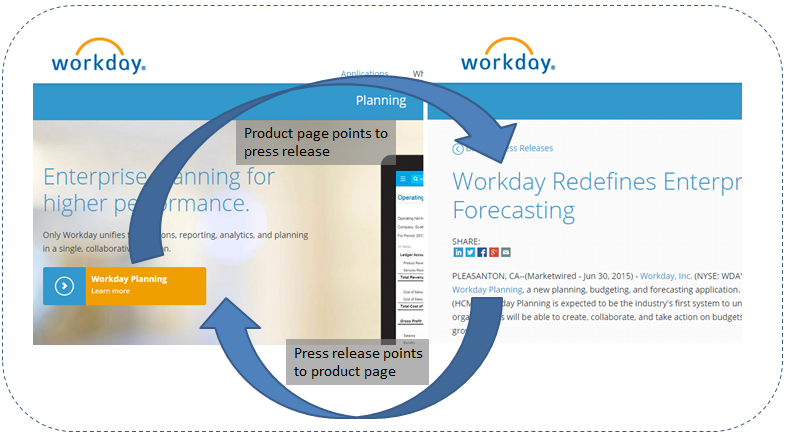 Workday’s planning strategy is enough to make an observer confused. They start in 2010-2011 with a strategic relationship with Tidemark, made more strategic by the fact that then-co-CEO of Workday Aneel Bhusri acted in his other capacity as Greylock partner to drive Greylock’s investment, and even more so by the fact that Workday co-founder Dave Duffield was individually an investor in the A-round as well. In April 2014, Bhusri quietly drops off Tidemark’s board. In May 2014, Workday makes a strategic investment in Tidemark-competitor Anaplan. This far in, it looks pretty clear what happened: Workday started out betting on Tidemark, but things didn’t work out (I’d guess because of Tidemark’s wandering eye and lack of focus on EPM), so they switched horses to Anaplan. It happens. In January 2015, Tidemark COO Phil Wilmington leaves Tidemark (per his LinkedIn). In February 2015, Workday appoints Wilmington EVP of Field Operations and a quarter later, on June 4, 2015, Workday promotes Wilmington to co-president. In mid-June of 2015, Workday announces leading a $25M round in Tidemark, rumored to be under fairly Draconian terms, including some non-trivial layoffs to cut the burn rate. OK, it’s more confusing but it still looks explainable from the outside. After switching horses to Anaplan, perhaps they found the grass wasn’t any greener, so they decide to switch back. People get divorced and then remarried. It happens. Maybe Wilmington influenced things and was trying to help out his old company, or maybe he had nothing to do with it. It’s impossible to see from the outside, but at the same time hard to believe he had nothing to do with it. Even today, almost 2 months after the announcement, the “Learn More” link on the products page for Workday Planning points to the press release, in an actual circular reference from the press release to products page — something I can’t recall ever seeing before in my career, and certainly implying both a hurried announcement and a lack of meat to support it. It’s another demonstration of why ERP and EPM are different categories. Even a highly sophisticated ERP vendor like Workday can’t get its EPM strategy right. It’s a different market, with a different buyer, with a different purpose, and which uses different and specialized technologies. This pattern existed in the on-premises days and has continued into the cloud. As such, it validates the desire buyers may have to go best-of-breed and buy EPM from a dedicated EPM vendor as opposed to expecting to see a great solution rolled into an ERP suite. Most importantly, Workday’s pattern suggests it will be years before their EPM strategy is clear, their in-house product is delivered and proven, and whether the final strategy rides on their in-house product, Tidemark’s technology possibly picked up via a future acquisition, or some hybrid thereof. Let me conclude by reminding anyone interested in doing EPM functions — like planning, budgeting, forecasting consolidation, reporting, and analytics — against Workday data, that at Host Analytics we have a clear strategy for Workday customers who want proven, cloud-based enterprise performance management (EPM). This entry was posted in Budgeting, EPM, FPA, Planning and tagged Workday. Bookmark the permalink.